When writing a spotlight piece, it is easy to get carried away with the use of superlatives. The fact is that members of “the Long Blue Line” can best be collectively described as “highly motivated over-achievers.” Even in that stellar company, Cindy Pond stands out as the crème de la crème. She has certainly risen to the top and is a member of the exclusive Women Presidents’ Organization. Born in Winnipeg, Canada, Cindy early on manifested an interest in and a talent for sports generally and volleyball in particular. After high school, she was recruited by several universities including Florida State, but she chose the W…because of its strong academic program. It proved to be a wise choice. From ‘85 to ‘95 she taught school in Pasco County Schools and coached College Volleyball for 2 years at St. Leo College. From ’93 to ’95 Cindy actively pursued a Masters in Educational Leadership until…then….boom…driven by her inner entrepreneur she decided to move to San Diego to start up one of the first web development companies in the world. This too proved to be a wise choice. The timing was right. New interactive media and digital technologies were emerging and Cindy had the skill sets, drive and business acumen required to create Taylor & Pond, a company that specializes in interactive and social media, web design, and online strategy. Since its founding in 1995, Taylor & Pond has grown to become one of the leading interactive agencies in the world. If being the sole owner/CEO of one successful business venture was a good thing for Cindy, then it followed that starting up another entirely different kind of business might be another challenge worth pursuing. Following her business instincts and a developing interest in fine wine, she opened Tango Wine Company in 2006. In short order, Tango Wine was voted the most popular Wine Bar in San Diego 3 years in a row and has become a local favorite for the downtown yuppie crowd of San Diego. Her involvement with that enterprise has nurtured her desire to travel the world in search of the best vineyards and fine wines. Her interactive agency successes recently led to another amazing opportunity for Cindy. During the Winter Olympics 2010, the Metro Vancouver Commerce, City of Vancouver and the Olympics partnered to find ways to establish a permanent legacy in the host city. They developed a program to attract businesses to Vancouver. Taylor & Pond was one of 50 businesses from around the world and from thousands of applicants to be awarded a VIP all expenses trip to Vancouver during the Olympics to learn more about the local business environment and Vancouver investment opportunities. 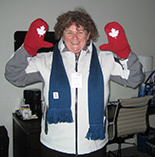 While most of the time in Vancouver was devoted to business and professional issues, Canadian born Cindy did get to see the United States vs. Canada hockey game, speed skating and sample all Vancouver has to offer. In 2008 Cindy received an Alumnae Achievement Award, the highest award that MFAeA can bestow. The criteria for that award are based on one's record of service to the association, the university and the larger community in which one lives. Putting her knowledge and experience to good use for the W, Cindy created and hosted MUW's first alumni listserv in 1998. She has generously contributed to the Foundation, social clubs, the original and historic alumnae association, the Patsy McDaniel Scholarship Fund, and individual students in need. It is impossible to over estimate Cindy Pond's contributions and support for our association both when we were known by our original name and as we are known now. Only because of Cindy's professionalism and expertise are we able to maintain our web site, blast special messages to our members, and produce this Newsletter. After each newsletter edition we create and disseminate, we receive compliments on the beautiful, professional look of our Newsletter. While it is true, that many volunteers are involved in the writing, editing, and composition of this newsletter, it becomes the product you are reading now at Taylor & Pond in San Diego. Cindy allows her very busy professional staff to devote work time to turning our work into a Newsletter we can all be proud of. If we were able to calculate the value of the in-kind support at her professional rate for all the time and resources Cindy has given to MFAeA, it would be a staggering number. It is not surprising then that Cindy has also been actively involved in the life of her San Diego community where she has received numerous awards for her philanthropy. She has served on the Board of the YMCA Youth and Family Services and is an active supporter of the Susan G. Komen Foundation, Home Start, Fronteras Unites Pro Salud and the San Diego Human Dignity Foundation. With all her successes as a businesswoman and with all her outstanding service achievements, one might imagine that Cindy is an all-work-and-no-play kind of woman. Nothing could be further from the truth. Cindy brings a force field of energy and joie d’Vivre with her wherever she goes. When her friends speak of her, it is always with a smile. When I think of Cindy Pond, I see her dressed all in black, driving her black Porsche convertible with the top down on a scenic coastal highway with her curly hair blowing in the wind as she heads for Tango Wine to play with her many many friends. Jimmie Meese Moomaw, a retired professor of Communication, is a writer and communication consultant living in Atlanta.